← [Misteri] Koin Indonesia beraksara huruf Arab? Tuanku Syed Sirajuddin (King of Perlis), the 40th generation direct descendant of the Prophet Muhammad ? Tuanku Syed Sirajuddin, born 17 May 1943. He served as the 12th Yang di-Pertuan Agong (Malaysia), from 13 December 2001 to 12 December 2006 . In October 1960, he was appointed the Raja Muda (Crown Prince) of Perlis while still a student. 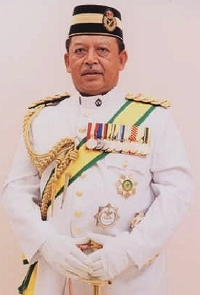 Tuanku Syed Sirajuddin was installed as the twelfth ruler of Perlis on 17 April 2000, the day after the death of his father, Tuanku Syed Harun Putra ibni Syed Husain Jamalullail (source : wikipedia). Pos ini dipublikasikan di genealogy, history, islam, kanzunQALAM, sejarah dan tag malaysia, nasab, perlis, silsilah, zuriat keluarga. Tandai permalink.